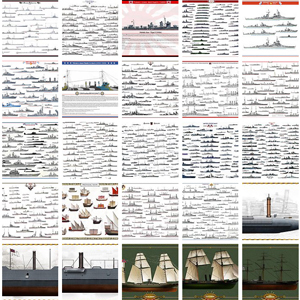 Both battleships were very similar, in fact they were near-sister ships, built at New Admiralty and Nicolaiev yards. They were relatively small, and only differed in armament (see later), that’s why they are seen together here. 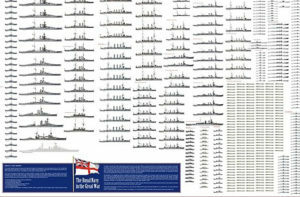 Contrary to past battleships like the Tri Svititelia and Navarin, she had as designed an higher freeboard, at 23 feets. 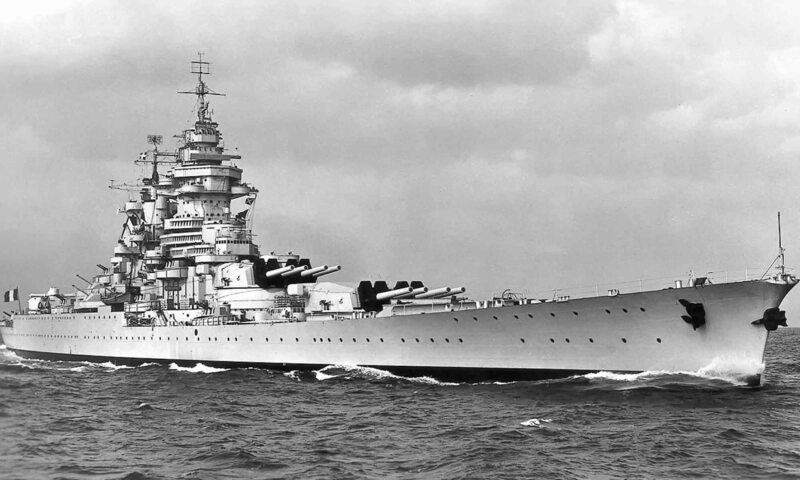 She was a 10,400 ton ship, armed with pivot-type turrets and four 305 mm (12 in) as main armament. 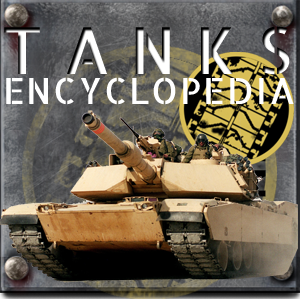 Her secondary armament consisted in a battery of six 152 mm in barbettes (6 in, 45 caliber), and her anti-TBs battery consisted in 12 x 3 pdr (47 mm) and 18 x 1-pdr (37 mm) and for close encounters, there were three 18 in (457 mm) torpedo tubes above the waterline, each side. 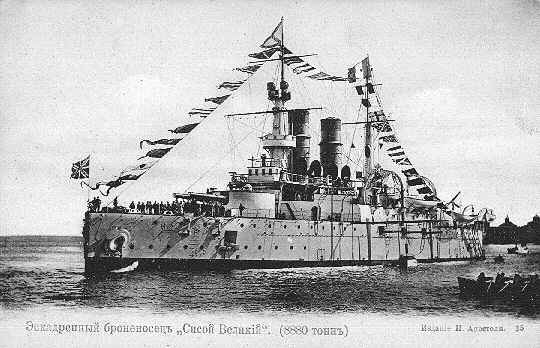 The Sissoi Veliky was laid down in may 1892, launched in june 1894 and completed in 1896. Her armour was made of nickel steel, her belt was up to 406 mm in the central section (4 to 16 in) thick, turrets 305 mm (12 in) overall, barbettes for the secondary guns were 127 mm (5 in), and the conning tower 203 mm (8 in) thick. Propulsion was assured by 12 bellevilles boilers steaming two Vertical Tubes engines producing 8500 ihp for 15.7 knots in top speed, and a reserve of 500 to 800 tons of coal. The Rostislav was started in Nicolaiev in 1895 and completed in 1898, the Rostislav was the sister ship of Sissoi Veliky (1894). It differed from the first one, sunk at sushima, by a few details: It has a draft of less than a meter and a light armor. With comparable machines, it was not much faster. But the biggest difference with the Sissoi Veliky was its main armament, reduced to 234 mm instead of 305 mm guns, in French-type turrets. In addition her secondary battery was amidship on either beam. Her main belt was 227 feets long, 7 feets wide, 14 inches on the waterline with 6 to 8 inches on the lower edge. Bulkhead were made in compound steel, not Harvey, 5 to 9in while the 5 in upper belt was 150 feets by 7,5 feets. The armour deck was 2 in over the main belt, 3 in at the ends, and the turret crowns were 2,5 in. She has 12 boilers, 2 shafts and a VTE engine for 8700 ihp (200 more than Sissoi), for 15.6 knots, so even slower than her sister ship. This ship experienced a sever accident in 1897, so just one year after its acceptance in service. A 12 in gun fired while the breech has not been properly closed. All the crew did as a result. 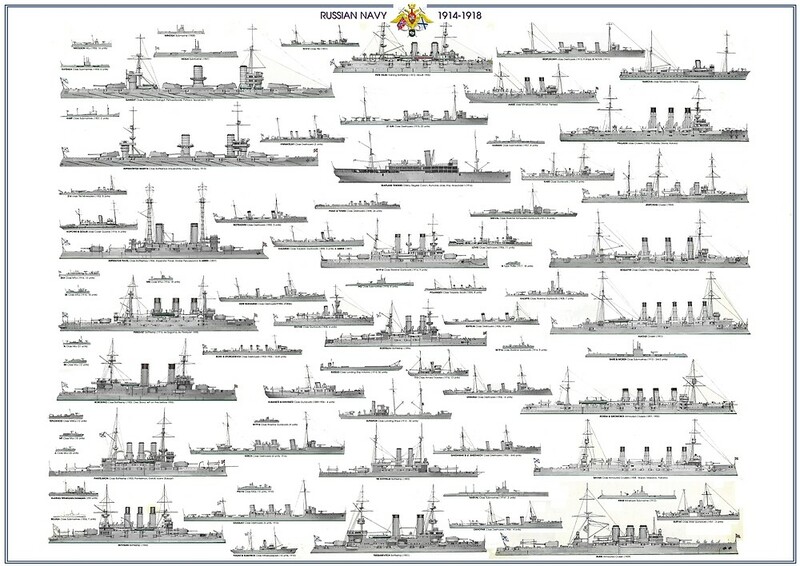 She spent some time in exercises, and was eventually part of the fleet that met the Japanese at Tsushima in 1905. She was badly damaged by gunfire, hit by a torpedo right aft, but survived. However, as she was to be surrendered to the Japanese officers valves were opened, and the ship flooded and sank. Captain Grand Duke Alexander Mikhailovich assumed command of the ship in 1898, the first Romanov to do so. The ship served as an ambassador in Istanbul and also transported other high profiles of the Imperial family, therefore Shipyards and contractors treated Rostislav with utter priority and care. The ship had its rudder frame reinforced and installation of a backup control post deep under the conning tower. 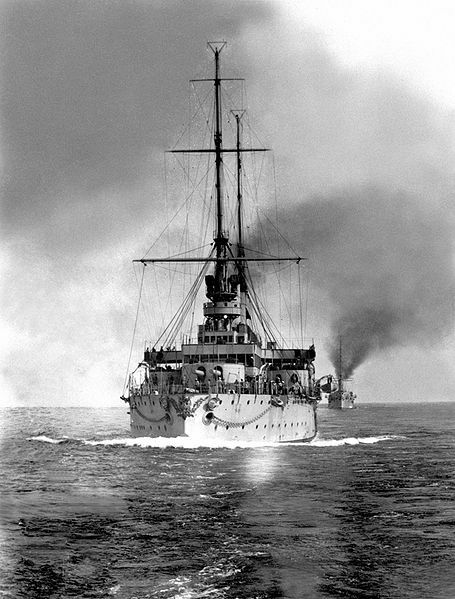 The Rostislav served as the junior flagship of the Black Sea Fleet until September 1912. 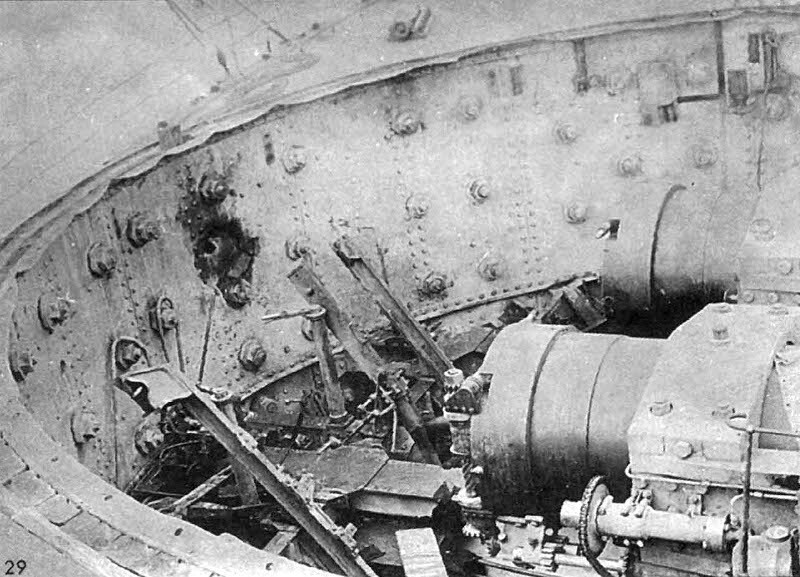 Exercisez showed its high coal consumption and revealing smoke panache, severe local overheating, buckling of fireboxes and sudden backdrafts which necessitated repairs and alterations, which weighted the ship so much that its main defensive belt was sunk below the waterline. In 1905 her crew was on the verge of open mutiny, while being ordered to deal with Potemkine’s mutineers, even destroy the rebels by force. The captains refrained to do so. But that occurred at the time of the Ochakov mutiny in November 1905. In 1907 there was a plan to remove elements up to 250 tons to help the ship’s overweight problem, but this was cancelled because of funds shortages. 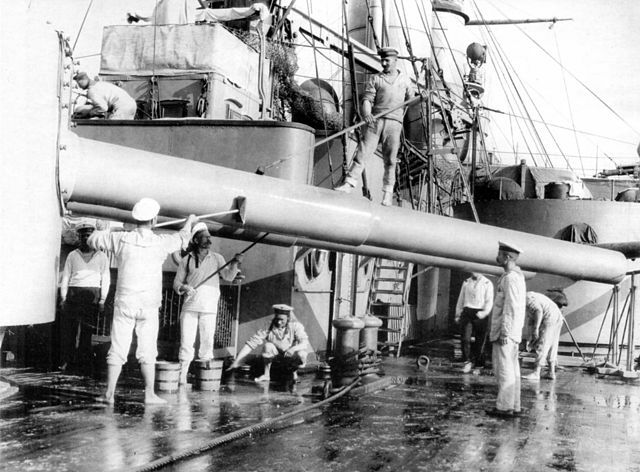 Rostislav’s main guns being cleaned. By 1914 she was of questionable military value, despite the removal of a dozen of her 37 mm guns and addition of a modern rangefinder, probably made by Barr and Stroud in 1908. She was versed into the reserve in August 1914. Still, she was an important part of the Black Sea fleet, and as such was engaged intensively in operations, notably to compensate for the absence of other more modern battleships. Between two sorties, her armament was changed considerably: The Torpedo-tubes and tertiary artillery were taken out for the benefit of four 75 mm AA pieces. In 1917 she was engaged against the Yavuz (ex-Goeben) and bombarded Turkish coastal installations. Like other ships in Sevastopol, her career was turbulent: In April 1918, she passed under Ukrainian control and flag. She was then captured by the Germans when they advanced, and then by the British after the German capitulation. 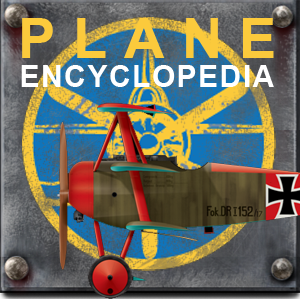 She the was partially made unusable by the sabotage of its machines in April 1919 to prevent capture by the Bolsheviks. She was eventually recaptured by the white Russians supported by the allies during the Crimean offensive, and used as coastal battery, but finally scuttled the 16 November 1920 in Kerch.